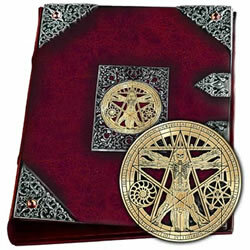 A lavish, burgundy red leather-covered binder featuring an intricately pierced brass and pewter skeletal Vitruvian Man and Fibonacci's Golden Section. Leather Stationary, etc. : Personal chattels-real of the most ultimate luxury and sophistication, for the study, library or office. Hand made treasures by the most skilled specialist craftsmen in Europe, from leather, English pewter and 'bone' resin. These items come to us from England. It takes about 2-5 weeks from the time you order items to the time you receive them, we recommend ordering with that in mind to avoid being disappointed.